German-based Evonik is one of the world’s specialty chemical leaders. As a technology leader with decades of experience in high-performance polymers, we provide solutions specially geared to the energy market. Our high performance polymers are used for a wide range of applications, including pipes for oil exploration, production and gas distribution, wind turbine blades and photovoltaics. Depending on the application, these polymers provide protection against corrosion or chemicals, increase the safety of energy transports or enhance the efficiency of energy generation. The polyamide 12 VESTAMID® NRG is specifically developed for oil and gas pipelines. These polyamides have extraordinary resistance to mechanical stresses, stress fracturing and chemicals, such as crude oil. Thanks to these properties, they can be used to protect the exterior and interior of onshore and offshore oil and gas pipelines. VESTAMID® NRG 1001 has been used as barrier and jacket layer in more than 800km of unbonded flexible pipes. The applications vary from risers to flowlines and jumpers across a range of pipe sizes, operation pressures and installation environments. The conveyed fluids of the product pipelines vary from oil, oil / water to oil / water / gas multiphase fluids. As a consequence VESTAMID NRG is broadly accepted as the material of choice in the flexible pipe industry, and leading oil companies such as Petrobras, ExxonMobil, Chevron and Statoil are typical end users. When facing the new arctic frontiers for installations and operations, extreme temperature conditions have to be considered for flexible pipes. With VESTAMID NRG 1001, the operator can specify and use the most ductile and tough polyamide material available for flexible pipes. Extensive fracture mechanic studies show that NRG 1001 remains ductile even at -50°C and remains ductile until the end of its considered lifetime. This excellent low temperature ductility and fracture toughness contributes to safe installation procedures and operation, even under arctic conditions. The PA 12 VESTAMID® NRG offers the combination of a compression-fit liner technology and a liner material, both with an extensive track history of use in the oil and gas industry. The integrated liner system of Swagelining Ltd, which uses PE liner, looks back on a long track history in subsea water injection applications and onshore rehabilitation of crude, gas, mining and water pipelines. This unique combination offers the operator a reliable, available and economic liner solution for subsea production flowlines and risers, and for onshore product lines as well. It overcomes the long lead times for corrosion resistant alloys (CRA) and offers total project cost savings of up to 50% compared to CRA solutions. In contrast to pipeline designs considering corrosion allowance, the VESTAMID® NRG integrated liner solution eliminates the need of corrosion inhibitors, resulting in savings and minimising the required equipment for corrosion inhibition, resulting also in space and weight savings for platforms. In onshore oil and gas operations the VESTAMID® NRG integrated liner solution offers the ability to extend the lifetime of matured pipelines operating at temperatures more than 60°C. Oil exploration and production is facing difficult challenges by constantly reaching higher temperatures and pressures. Subsequently the requirements on chemical resistance of engineering materials are increasing. With its high temperature thermoplastic material VESTAMID® PEEK, Evonik can offer material solutions to the industry designed for molded to extruded products, for seismic to refining applications. The following two examples can be found. Especially in downhole casings thermoplastic liners are gaining more and more focus. With increasing requirements, driven by an increase of operation temperatures and pressures, the VESTAKEEP® PEEK polymer, with its high temperature capabilities combined with its excellent impact resistance, offers a valuable solution. VESTAKEEP® PEEK polymer differs from other PEEK materials, with a 15% higher impact resistance and 50% higher tensile modulus at 150°C. CRA hoses are widely used in Umbilical applications. Even so, availability, economics and fatigue are draw backs of this solution. VESTAKEEP® PEEK offers a thermoplastic alternative to these, allowing the design engineer to design thermoplastic hoses capable of operating above 120°C. In addition our tailored grade VESTAKEEP® Ultimate distinguishes itself from standard PEEK grades by having the highest tensile modulus at operation temperatures greater than 100°C, resulting in the highest collapse pressure resistance and significantly improved ductility. 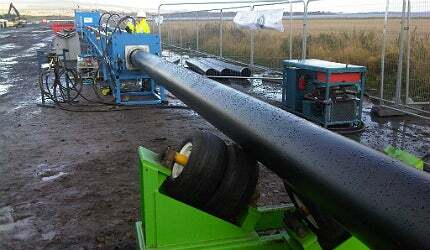 Another solution for Umbilicals are VESTAMID® based multi layer tubings (MLT). VESTAMID® MLT possess the lowest permeation for a broad spectrum of media and have an optimised chemical resistance due to its internal fluoropolymer layer. The permeation of alcohols is reduced by a factor of more than 60, compared to thermoplastic monowall tubing. As a system provider, Evonik also offers compressor parts and wear tapes. PPSU and PEEK-based anti-wear tapes minimise abrasion between individual steel reinforcement layers in flexible pipes, increasing the life of the pipes for deep-sea exploration. Standard PEEK materials are liable to brittle fracture during insertion of PEEK rings into the groove. By contrast, VESTAKEEP® L4000 G, with up to 15% better impact resistance, is the ideal material for filigree, large diameter sealing rings inserted into valves and fittings. Glass fibre reinforced VESTAKEEP® moulding compounds also benefit from the increased impact resistance. VESTAMID® NRG 1001, a high-performance polymer, can already be found in a total of more than 800 kilometres of pipeline. German-based Evonik Industries is one of the world leaders in specialty chemicals. High-performance polymers leader Evonik will be exhibiting products including VESTAMID® NRG and VESTAKEEP® PEEK at booth #4527 of OTC 2014 being held from 5 to 8 May in Houston, Texas. Evonik Industries has launched a medical devices project house with its main campus in Birmingham, Alabama, US, along with a branch in Hanau, Germany. DYNAVIS® Technology made its North American debut and its inaugural appearance at the CONEXPO-CON/AGG trade show and IFPE conference at the Las Vegas Convention Center from 4 to 8 March. After launch in Europe, products from Evonik Industries will be featured at the American Coatings Show in Atlanta. Evonik Industries has revealed that each of its primary implantable VESTAKEEP® PEEK product lines have been referenced in customer products that have received US Food and Drug Administration (FDA) 510(k) clearance for permanent implant use. Evonik Industries has announced a plan to invest more than $15m in the new Richmond Business & Innovation Center and create an estimated 50 jobs over the next five years.